The Fourth » A wild little girl appears! A wild little girl appears! 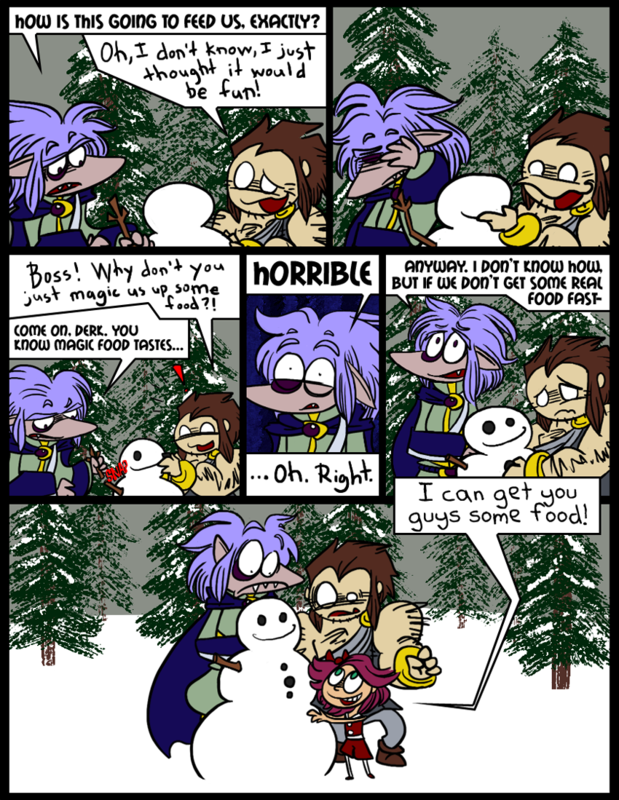 Derk frequently forgets that magic food tastes bad. He’s just… so hungry, sometimes. If you don’t think anyone could ever be that horrified by the way something tastes, you’ve never had to take Day-Quil. Notice how Skärva tries to make the snowman a little bit more in his image, although making an all-out snow-shark-man would have been too difficult. I am extremely fond of this comic, art-wise. And very, very pleased to introduce our newest important character, who shall for now just be known as “little girl,” although her name is no secret if you followed me over here from certain other places. It just seems wrong to use it before it’s introduced in the comic. a wild little girl is paralyzed! Child abuse!! Skärva’s not THAT evil! Disappeared ‘OFF PANEL’, at least. As always, great work. I can’t wait to find out who that kid is.